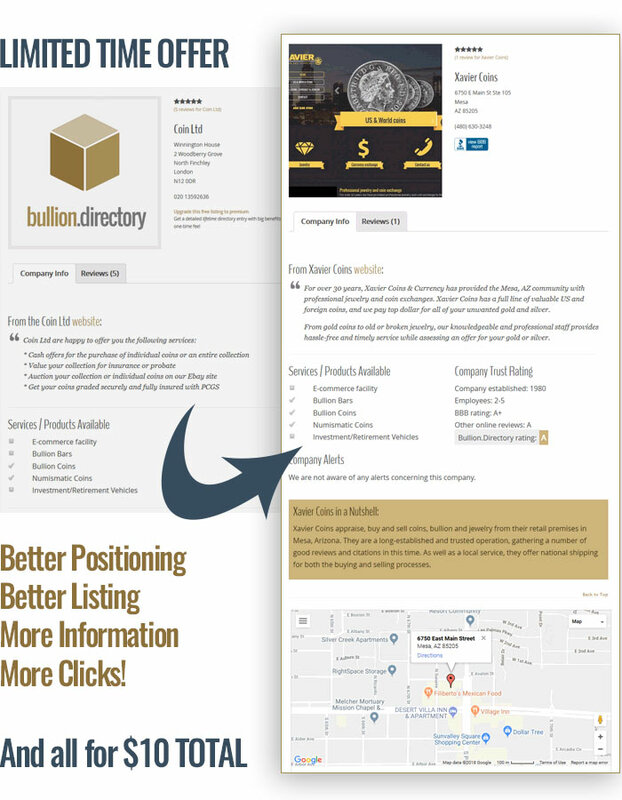 Please fill in the form below to add a free listing to Bullion.Directory. Fill the form to get started with your LIFETIME upgrade! Want to take advantage of our $10 LIFETIME upgrade? We will only add listings for bona fide precious metals dealers – that is companies actively buying and selling their own stocks of finished bullion and coins, or refining/minting precious metals into finished products for the bullion market. Requesting a listing does not guarantee we will add your listing. We do not list affiliates, news sites, gold coupons sites and gold price aggregators, nor sellers, resellers, importers, exporters or dealers in gold dust, alluvial gold or blood gold/conflict gold. *Free listings are at our discretion – listing may take 2-3 weeks at peak times. Upgrades get listed within 24hrs.